"What adorable creatures are these?" you ask. They are Marimos and they are a type of green algae. 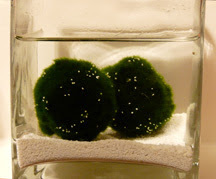 Some call them by other names: Cladophora balls, Lake balls or Moss balls, but I think Marimo suits them. My son found them at the pet store when he was setting up a beta tank. I was so enamored with them that I asked for a Marimo habitat for Christmas. I'd never heard of them before. They grow in lakes in Iceland, Scotland, Japan and Estonia. Wave action rotates the balls and helps maintain their round shape. These little guys are so cute and you can tell they are best friends.